There are separate hostels for girls. We have two different hostels named as: Kaveri and Ganga for girls. 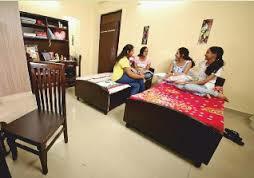 Ambience with the right blend of studies and extracurricular activities has been created in the hostels. The living rooms are well furnished and spacious with all the modern amenities. A well designed common room provided with television facility is another feature. A separate gymnasium has been provided in the hostel to improve physical health & vigour. The Hostel has gymnasium equipped with the latest state of art equipment to ensure the good physical health of the students. Laundry service is also available for washing and ironing of the clothes with in the hostels. A 24 hour canteen service has been provided in the hostels to the students. This will be provided hygienically prepared snacks, soft drinks and other eatables to students on payment basis. Staying in the hostel is mandatory for all the students.